We've been hoping for a surprise free, boring pregnancy, but this past week we got a big surprise, fortunately, the good kind! I'd been a little nervous for the emotions of this Mother's Day. It should've been my first one as a new mother, posting too many pictures on social media with a new baby. I just never know when a wave of 'what-ifs' and emotions will hit me, you know? But, this week didn't disappoint. Instead of looking back, it's been a week full of hope, new firsts, and looking forward. We finally made it back to the sonogram room. I was biting my tongue to stifle the worry-tears before I even sat on the table. Hormones are the worst. Mercifully, our sonogram tech was amazing, and she got straight to business. We heard that familiar fast paced 'whoosh' sound that meant I could exhale the breath I'd been holding since I last heard a heart beat on week 8. And, the relief and the joy of that next 15 or so minutes...there aren't even words! I mean like, Christmas morning of 1994, the 'Christmas of the red Barbie Corvette convertible' levels of joy. Our little one was putting on a SHOW! Rolling around, kicking what right now appear to be my bird legs, a tiny little profile with the cutest nose that to me, looks like a carbon copy of my husband's. WHAT?! I had no idea that was possible at 12 weeks. 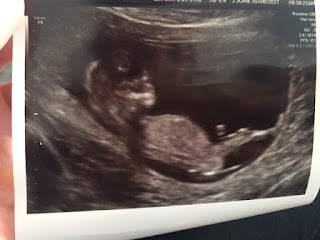 I had not in any way mentally prepared for this, but our little one was measuring a little ahead and must be in the perfect position, because the sonogram was clear as a bell. She pointed to the screen and says--"Only one thing would be sticking out right there." I said, "So it could be a boy?" She said, "No, it IS a boy." Shocked. I was shocked. 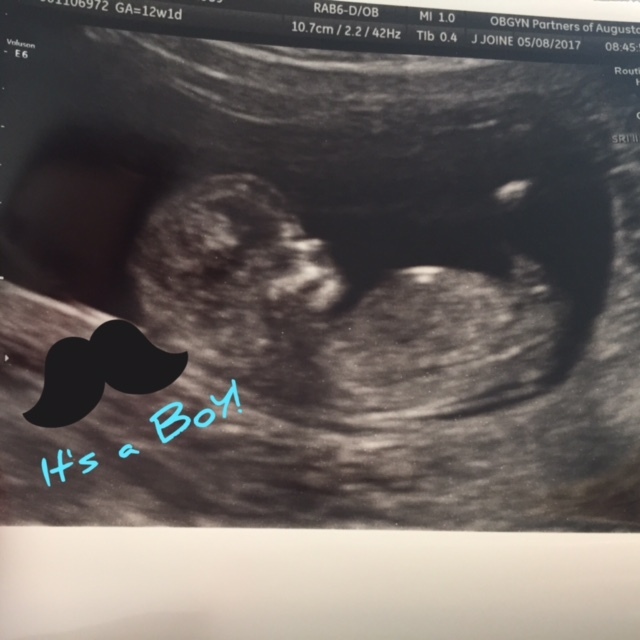 My whole life, I've wanted a little boy first. Of course, that all changed when we lost our little girl in October. I'm not going to lie, I had really been hoping for a girl this time, too. My husband and I both had. But, as soon as she pointed to that screen, and my brain made sense of it all, I was in. Completely wrapped around that little boy's finger. There were already dinosaurs and Tonka trucks, super hero capes and little league games playing out in my head. And, the happy tears choking up my husband's voice were all I needed to know he was in love, too. A healthy baby boy. I've never been able to identify ANYTHING in a sonogram before. I've looked at dozens and mistaken the legs for the head before. 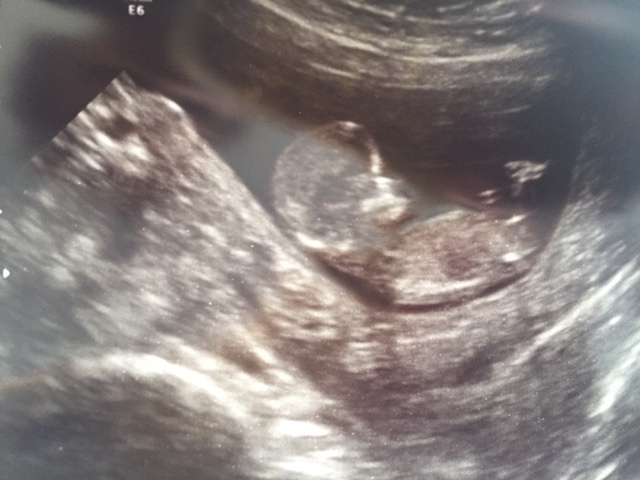 I've oohed and ahhhed at what could have been a fuzzy picture of a frog for all I knew, but this was OUR baby, and I could tell exactly what was happening on the screen every time he rolled, his little back facing us, his legs kicking out. I mean, he was just a 2D gray and white silhouette, but I swear he's the cutest thing I've ever seen. I dare Amal and George's twins to rival our baby's sonogram. And guess what? Our child is already a prodigy. At just 13 weeks old, our baby is already giving his mom Mother's Day presents. Just when I was thinking Mother's Day weekend couldn't get much better (no nausea on Saturday, my best friend mailed me an adorable onesie, and Austin got me a pre-natal massage gift certificate and indulged my pregnancy craving for PF Chang's and a chick flick) I was midway through my Chang's Spicy Chicken when I felt what seemed like the longest bout of stomach growling I've ever had. But, since I was shoving my face full of gooey chicken, and clearly no longer hungry, I put two and two together..."I think the baby is moving." After trying to decipher the morse code happening in my stomach for the remainder of the meal, I convinced myself, nah, maybe that's not it. Well, today in Lowe's...I had the same feeling! I think I can feel him moving already! Or 'quickening' as Google tells me they call it. How perfect is that? On Mother's Day? Now, if this next six months could 'quicken,' so I could meet our little angel. I can't wait!